"What are Adult Day Centers..Besides the Basis for Political Insults?" Howard Gleckman, Forbes contributor and unpaid board member for the Jewish Council for the Aging of Great Washington, has written an op-ed to educate regarding the value and importance of Adult Day Services in light of recent comments. Please press the following tab to download the article: "What are Adult Day Center..Besides the Basis for Political Insults?" Informative article regarding the strengths and benefits of adult day services. Sheds lights on the need for the clients and the caregivers. Also discusses the importance on investigating and selecting the right adult day service for loved ones. Written by Carol Bradley Bursack - Elder care author, columnist and speaker Carol Bradley Bursack is an AgingCare.com contributing editor and moderator of the AgingCare.com community forum. 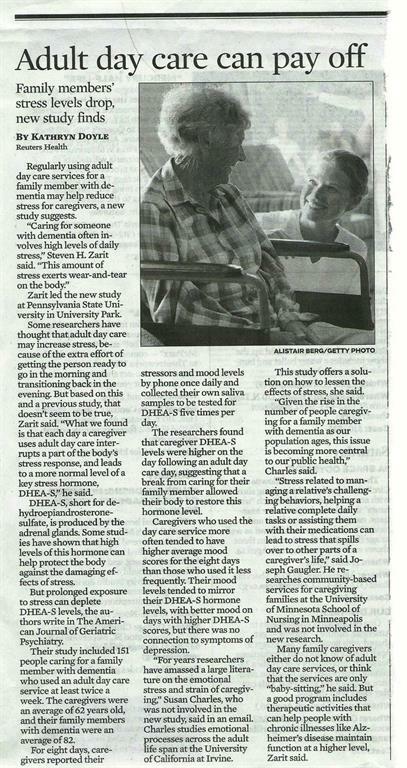 On April 1, 2014 the Chicago Tribune published an article about the benefits and outcomes of Adult Day Services. The focus of the article was describing a study performed by Steven H. Zarit at Pennsylvania State University in University Park. The link to this informative article is listed below. The National Institute on Aging (NIA) has released "Talking With Your Older Patient: A Clinician's Handbook," a comprehensive publication designed to enhance health care providers' communication with older patients. The overall aim of "Talking With Your Older Patient" is to introduce and/or reinforce communication skills essential in caring for older patients and their families. It suggests practical tips, techniques, and approaches to help with diagnosis, promote treatment adherence, make more efficient use of clinicians' time, and increase patient and provider satisfaction. talking with patients about cognitive problems. It also includes an extensive list of resources and a tear-off chart giving contact information for national organizations that address specific concerns such as financial assistance, nutrition, and transportation. A list of other free publications available from NIA is included as well. To download or order free copies of "Talking With Your Older Patient," visit National Institute on Aging or call the NIA Information Center toll-free at 800-222-2225 or 800-222-4225 (TTY). Bulk quantities (25 or more) may be ordered by visiting http://niapublications.org/bulkorder1.asp. Note: This new, free offering replaces the NIA publication entitled Working With Your Older Patient: A Clinician's Handbook. The following links provide valuable information regarding Adult Day Services. There are several organizations and important studies that are represented within this information. If you can not find the information you are looking for, please go to the Contact Us link on the main page and we will try to assist. Click here to access the official website of the Fall Prevention Center of Excellence. Our mission is to identify best practices in fall prevention and to help communities offer fall prevention programs to older people who are at risk of falling. The latest issue of Connections, the newsletter of the National Institute on Aging's Alzheimer's Disease Education and Referral Center, is now available online at: http://www.nia.nih.gov/Alzheimers/ResearchInformation/Newsletter/CurrentIssue.htm. Establishing and successfully operating an adult day service is not an easy task. Luckily many have gone before you and a number of excellent resources are available to you as you begin this endeavor. 1. Recognize that a “good heart” and love of the elderly is NOT ENOUGH. You must be equipped to operate a business. Visit the State of Illinois Business Portal website http://business.illinois.gov for information. This site offers access to a Step-by-Step Guide to Starting Your Business, A Guide for Organizing a Not-for-Profit Corporation, A Small Business Start-up Kit and a search engine to locate forms needed to establish a business in Illinois. The website of the Minnesota Council for Non Profits also has valuable tools. Click here http://www.mncn.org/ then select "how to start a nonprofit". In Illinois there is no state-wide licensing process for Adult Day Service, but providers may seek contracts for reimbursement from The Illinois Department on Aging (IDOA), The Illinois Department of Human Services – Office of Rehabilitation Services (ORS) or the Veteran’s Administration (VA). Each entity has its own application process, requirements and expectations. IDOA is the primary third party payer. Information about the application process is on the IDOA website. Click here to view requirements and the application with instructions. Familiarize yourself with any local and county building, zoning or fire/safety codes that may apply to adult day service operations within the jurisdiction of your proposed center. Applicable codes are referenced in IDOA administrative code Section 240.1550 (b) (3) (A). 2. Become familiar with standards for providing quality adult day service. Visit www.nadsa.org The Publications and Resources tab on this site features the manual Adult Day Services Standards and Guidelines for Adult Day Services. This edition provides a comprehensive outline of “best practices” in all areas of facility operations and service delivery. Emphasis is placed on the importance of target population identification and assessment, administration, organizational structure, individualized plans of care, direct service provision, staffing requirements, facility design and program evaluation. 3. Remember, that in addition to the business aspects of the program, there are clinical skills needed to serve the elderly and clients with dementia. Training sessions offered by the Illinois Adult Day Service Association are published on this website. 4. Join Illinois Adult Day Service Association (IADSA). IADSA sponsors training events and as a member you become part of a network of providers with experience to share.